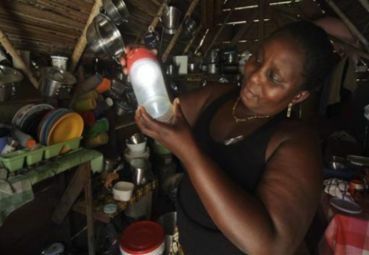 Since purchasing it in November 2011, her income has risen 30%.She no longer pays $2 a wk for kerosene, nor does she pay $20 a mo. to rent a space for her tailoring business.Having light at home has allowed her to move her business to her home. LONDON (AlertNet) � Teddy Namirembe�s life has changed thanks to one solar lamp. Since purchasing it in November 2011, her income has risen 30 percent. She no longer pays $2 a week for kerosene, nor does she pay $20 a month to rent a space for her tailoring business. Having light at home has allowed her to move her business to her home in Buwama, Uganda. Better yet, her children now have light to study at night, and Namirembe, who once struggled to pay for school fees and decent uniforms, has been able to afford better education, uniforms and food for them. �All the money that she would be spending on rent is now going into her pocket and she�s now saving that for her kids,� said Evelyn Namara, the Ugandan program director of Solar Sister, a women-led African organisation that is supplying thousands of women with solar products that change lives while mitigating climate change. Solar Sister is one of nine projects backed by the United Nations� Momentum for Change initiative that will be featured at this year�s UN climate negotiations in Doha. Other projects include the introduction of electric vehicles in Sri Lanka, energy-efficient brick production in Peru, and water purification in Kenya. The projects, deemed �lighthouse activities� by the United Nations� Momentum for Change initiative, are all efforts to adapt to or mitigate climate change that benefit the poor and have the potential to be expanded across the world. �These are currently small examples of what can be done. The whole purpose of them is to show that it can be done and to inspire further and scaled-up action either in the same country or in other countries because of the need to close the gap on both mitigation and adaptation,� said Christiana Figueres, the executive secretary of the UN Framework Convention on Climate Change. Solar Sister, the African solar effort, works to empower women in east Africa by giving them a solar energy �business-in-a-bag.� With start-up support from Solar Sister, the women sell energy-efficient solar lamps and solar phone chargers to local communities. Each lamp can reduce carbon dioxide emissions by 1.5 tonnes over its 10-year lifespan by reducing the need for kerosene lighting, according to Momentum for Change. The projects helps women gain an income and their customers benefit from lower energy costs, clean light and the elimination of toxic fumes from kerosene-based lighting. Other lighthouse projects focus on improving urban air pollution, educating people on coastal erosion, and processing organic waste into compost, among other pro-environment initiatives. �This is the continent with the least access to electricity and energy than any continent on the planet,� he said. Whether it adopt clean � or dirtier � forms of energy will be crucial to determining future climate-changing emissions, experts say. Namara, of Solar Sister, believes her organisation will be able to expand its programs across Africa. Nuttall agreed that �lighthouse� projects like Solar Sister had potential for expansion, but warned that boosting the size of smaller scale efforts isn�t always easy. �Scaling up of these things can sometimes represent challenges to a business model,� Nuttall explained. Getting financing can be difficult in some developing countries, for instance, he said. �I think the international community needs to look very closely at how to support these projects during their growing pains,� he said. He also added that cultural differences can halt expansion, and that success is never guaranteed. �Some of them go through, and some of them fail,� said Nuttall. Jon Christianson is an AlertNet Climate intern. This is but one of many positive projects occurring in developing countries. They didn't cause climate catastrophe, but they sure are paying for it, with their lands, their way of life. I donate to these causes, it's one way to help insure that money is used to help people. Another is the "mini-loans" mostly they have increased small business (many owned by women) in developing countries. These loans may be a small as $10.00 (US money) yet, they make a major difference for people that have nothing. I think it is note worthy that these loans are repaid, and the woman that are able to provide for their families are taking a great interest in the local habitats to protect animals of their regions. Yes Kit, there sure are many projects not involving major corporations that are making a difference in developing countries. You cannot currently send a star to Kit because you have done so within the last week. It is indeed LMj. You are welcome. I love low-tech and innovative green projects. Me, too, greenplanet. You cannot currently send a star to greenplanet because you have done so within the last week. Me, too Dave so I try to share when I find. Love it and hope to get a follow up in the year to come. Tx! You cannot currently send a star to Jude because you have done so within the last week.